I love turning off of US 40 onto County Road 83, the Fraser Valley stretched out before me, the drama of the continental divide rising above, and the Devil’s Thumb Ranch Resort and Spa up ahead. Last Sunday was a blue sky day, the white snowy valley dotted with cross country skiers and horses lazing about. Once in the cozy interior of the lodge, I was greeted by Anna Thompson, Wedding Sales Manager. A wedding would be taking place in a few hours. In the meantime, I went around the property with her getting an inside look at what makes this place run so impeccably, all the while asking my numerous questions about this enchanting place. When you arrive at DTR, you are enveloped by its charms. The Broad Axe Barn has always been a perfectly picturesque spot. Now, with the addition of the High Lonesome Lodge last year, there are two compellingly beautiful spots to be married at the ranch. These two elegantly ranch-y indoor spaces also have a scenic outdoor ceremony option, which, with crazy Colorado weather is a pretty important feature. DTR has on-site, award-winning food, and an extensive wine selection. So how do you choose which site? Part of me thinks it hardly matters - if you’re lucky to be at the ranch, you are really lucky! Your decision may come down to capacity or availability. If both choices are available to you, visit the ranch and see which one you imagine celebrating “I do” in more. 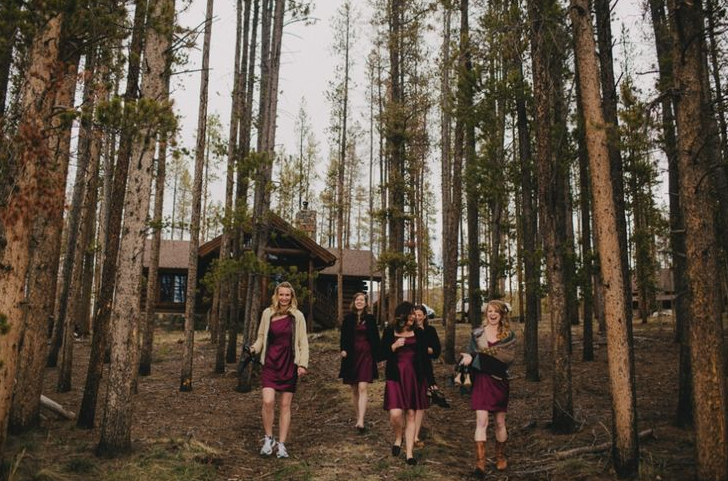 Other spaces worth mentioning are the gorgeous lodge rooms and cabins for getting ready (as well as for accommodating and impressing your guests), the glass Timber House for small ceremonies or cocktail hour, and the wine cellar for an intimate rehearsal dinner. When you mention DTR around these parts, the response will be something resembling a longing, fond sigh. It seems everyone who comes here is somehow touched by the specialness of this place: recalling relaxing spa treatments and yoga classes; snuggling up in Heck’s with a book; indulging in s’mores and wine around the outside fireplace; adventures on bikes or horseback. This is the wedding venue for a couple who wants a weekend of wedding festivities, where guests have access to everything on-site and will come away with that longing, fond sigh that signals, "This was a memorable place for a wedding!" Season: Year round. You may make the decision based on your favorite seasonal activities; skiing, skating and sledding, or fishing, swimming and hiking. Capacity: Broad Axe Barn, up to 160; the new High Lonesome Lodge, up to 350. Each indoor space has it’s own outdoor ceremony spot. Availability: For Summer 2015 there are some early openings, but none in late season. For Fall 2015, it's full for September, but currently booking for the rest of the Fall and into 2016. Summer 2016 dates are already going fast! So as DTR would say, "Go on now. Git." Distance from Boulder: 90 miles. You’ll head to the mountains, but thankfully avoid the dreaded Eisenhower tunnel traffic.